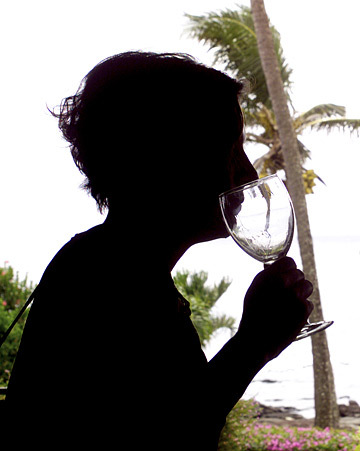 The annual Kapalua Wine and Food Festival on Maui offers a chance to sip alongside the world's best wine minds, in a tropical locale. 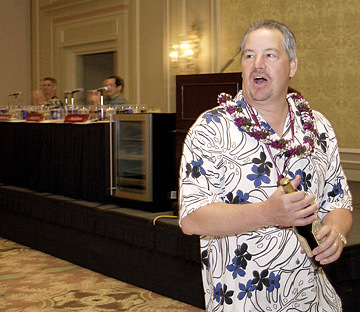 KAPALUA, Maui » There was a nasty bait-and-switch at the Ritz Carlton Kapalua last weekend, as thousands flocked to the 25th annual Kapalua Wine and Food Festival. Or maybe Saturday's "Master Sommelier 103" workshop just seemed that way to this festival virgin after the previous night's "Grand Tasting," which featured more than 100 kinds of wine and champagne. First lesson learned at Kapalua: Don't mix wine, champagne, beer, sake, MORE wine and a (completely unnecessary, in hindsight) shot of Jack Daniel's, under any circumstances. Ever. In stark contrast to Friday's fun and games, the sold-out audience seated in neat rows in a hotel ballroom at 10 the next morning appeared more like a crowd waiting to start an exam. The only thing missing was the blue books. 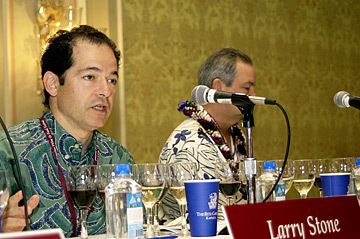 Master sommelier Fred Dame addressed a class of wine enthusiasts in Kapalua Saturday. DESPITE A number of attempts to convert me to the grown-up's grape juice, I remain a devotee to the hops and barley brigade. But I've always respected guys like Chuck Furuya, those who have gone through the training and certification to receive the coveted designation of master sommelier. It's a long and arduous task, one that only 79 people in North America have completed in the 37 years since the first examination was administered by the United Kingdom Court of Master Sommeliers. I guess I truly hadn't realized the passion some have for wine, despite having a number of friends who enjoy the stuff and a roommate who is on track to become a master sommelier himself one day. And I definitely had no idea of the depth and breadth of knowledge necessary to earn the MS title. Which is why I was jarred out of my Red Bull-infused haze when I realized the first item of business at "Master Sommelier 103" was a written test. Master sommeliers Rob Bigelow, John Blazon, Fred Dame and Larry Stone sat at a table on stage, and quickly instructed the 100 or so "students" around me to get started. What are the three best regions in the world for syrah? Cabernet is the major grape variety in what sub-region of Bordeaux? What are the four noble grape varieties of Alsace? Ten questions. I couldn't answer a single one. THE MASTER SOMMELIER certification has three parts. Not only are candidates expected to memorize facts for a written examination, a practical exam on service and salesmanship is also administered. Master sommeliers are expected to "exhibit a high standard of both technical and social skills, demonstrating ... courtesy and charm," according to the UK Court of Master Sommeliers' Web site (www.mastersommeliers.org). Along with being able to decant a bottle of wine or open a bottle of champagne correctly, they're expected to have knowledge of beers, spirits and even cigars. Once the 10-question slaughter was completed (surprisingly, a number of people in the room had perfect scores, how you figgah? ), it was on to the blind tasting portion. Six glasses sat atop a white piece of paper with no distinguishing labels, crackers and a bottle of water on one flank, a paper cup spittoon on the other. "We begin each (tasting) with a blank tablet," says Dame. "We're deducing things along the way." During the actual test, candidates have just over four minutes to visually inspect, smell and taste each glass of wine. Then they're expected to process all of that sensory information into an initial and final conclusion, authoritatively stating where the wine is from, its vintage and its level of quality. Wine workshop master sommeliers, including Larry Stone, left, instruct participants to sip, swish and swallow. I'm reminded again how much serious wine drinkers are expected to know. It appears I'm the only one in the room learning for the first time that you can tell how old wine is by looking at its color separation between the middle and rim of a slightly tipped glass, or that the human nose reportedly can detect more than 30,000 different scents. IN ORDER to put folks at ease, Dame instructs the room to grab the first glass and take a big sip, swish it around a bit, and then swallow it all. Why was that important, he asks? So everyone stops to remember that this morning's tasting won't be graded, and we can have fun! For the next hour, we make our way through the six glasses in front of us, Dame and Bigelow getting up to run things game-show style, complete with bottles of wine as prizes. Entire rows teamed up to "present" to the "testing panel," with a few in the room brave enough to try it by themselves. When it was all over, I'd learned a variety of new techniques to use when hanging out with my friends at wine tastings, plus a few tricks to disarm obnoxious wine snobs. Master sommelier Stone also confirmed a hunch I'd always had about wine: "You have to pay for complexity." My advice? Leave those tests to the wine nerds -- you're better off making friends with Furuya or Hawaii's other resident master sommelier, Roberto Viernes, and trusting them to pick a few good bottles for you. It doesn't take a rocket scientist to realize that drinking the wine is a lot more fun than having to learn about it. Or better yet, just order a beer! The wines tasted Saturday: 2005 Tupari Cabernet Sauvignon, 2004 Calcaire Chardonnay, 2004 WesMar Russian River Valley Pinot Noir, 2003 Rudd Cabernet Sauvignon, 2003 Navarro Vineyard Gewurztraminer, 2002 Penfold's Kalimna Shiraz, Bin 28.